View the XPS page flip publications on your iPod, iPhone, Android and more. Create from XPS to digital magazines, page flip books, brochures and interactive catalogs for both online and offline use. Flip XPS allows you to build stunning flippingbook publications from XPS (Open XML Paper Specification ). 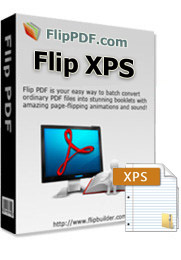 Flip XPS lets you convert XPS documents into Flash page flip digital publications that you can embed into your website. With Flip XPS, you don't need any flash skills, only import your XPS, and then choose the theme(look&feel) templates from a variety of pre-set settings from Flip XPS, finally to build your attractive flip book with the real page turning effect. Flip XPS gives a realistic page flip effect to your publication. This is the best way to display your presentation, Online Catalog, Digital Brochure, Flipping Book, Interactive Flyer, Virtual Magazine, Newspaper, Flip Album, Photo Album, Work Portfolios, Corporate Presentations etc. At a Glance: Easy! 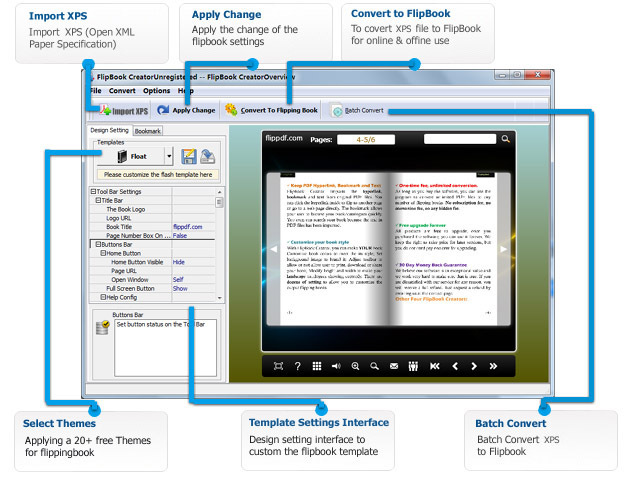 Even a new user, you can use Flip XPS within a couple of minutes without any special learning. Open XML Paper Specification (also referred to as OpenXPS), is an open specification for a page description language and a fixed-document format originally developed by Microsoft as XML Paper Specification (XPS) that was later standardized by Ecma International as international standard ECMA-388. It is an XML-based (more precisely XAML-based) specification, based on a new print path and a color-managed vector-based document format that supports device independence and resolution independence. OpenXPS was standardized as an open standard document format on June 16, 2009. With our easy to use interface, you can make a digital publication in a few mouse clicks! Even a new user, you can use Flip XPS within a couple of minutes without any special learning. Just import your XPS document, select the flipbook themes, and then click the publish buttom! Beside Flash version, all publications created by Flip XPS will also include HTML5 version. The readers will be able to open your flip page publication in any environment (PC, Mac, iPhone, iPad, Android, or Windows Mobile), and you can even publish at your Facebook page. Flip XPS supports analyzing and importing table of contents from XPS files. After that, you can edit the imported table of contents. If you want to create it by yourself, instead of importing from XPS, or your XPS does not contain a table of contents, Flip XPS can help you to create table of contents for your digital publication. If you have a Google Analytics account, you can make use of Flip XPS’s built-in functionality Google Analytics Embedding. The code of Google Analytics can be embedded to each book and all statistics will be available from your Google Analytics account live. Create, design, control and increase your marketing effectiveness using Google Analytics within the publications. Once you have purchased the software, you can use the program to convert an unlimited number of XPS files to any number of page-flipping eBooks. No subscription fee, no conversion fee, not limited to a single website.